I’m still working on a good system for capturing screenshots from console video (so very close to solving this problem after all these years), but I had an itch to process at least one game today. I remembered I have a large pool of Barbie games that has gone completely untouched up until now. Even though MobyGames enjoys good coverage of Barbie titles, I still have quite a few that don’t show up. There is really nothing to fear– I’m quite confident that these are well-engineered (i.e., won’t crash or screw up my system), colorful, and above all, easy games that will take no more than a 1/2 hour to breeze through. In fact, I almost feel like I have an unfair advantage at gaining MobyGames points because I have access to such a large pool of games like this. So I decided to go with Barbie as Princess Bride today. The story unfolds with Princess Barbie and Prince Ken growing up in a kingdom somewhere “on the other side of the world”. They are really quite keen on each other and have every intention of marrying when they become the appropriate age. It’s not explained whether or not the prince and princess are actually siblings, though per my understanding of royal traditions, that would not be entirely unexpected. When Prince Ken is old enough, he sails off on a vague, undefined journey, as princes are wont to do. 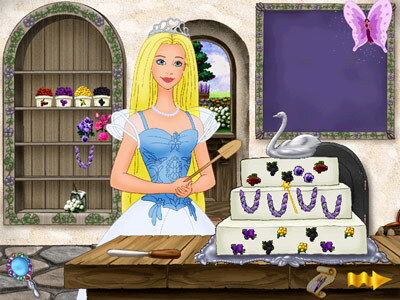 After patiently and optimistically waiting for many years, Butterfly Fairy shows up to assure Princess Barbie that Prince Ken is on his way back and that she should prepare for the imminent wedding. So what kind of game is on offer here? Why, it’s a wedding planning game! If there’s anything this gaming blog can claim to specialize in now, it’s wedding planning games. 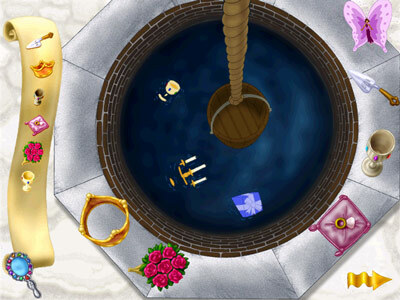 All 12 of the minigames/activities (even one completely non-interactive musical interlude) revolve around the princess’ upcoming nuptials. The first 2 activities pertain to delivering wedding invitations to all of her woodland friends. Whether she consorts with any humans instead of just fairies and forest creatures is left unexplained. Note that “woodland friends” includes skunks. Ah, her wedding, her guest list. Fortunately, so strong is the love between Ken and Barbie that Ken is likely to overlook the abomination I decorated on his bride’s behalf. As alluded previously, one of the activities (#6) is actually a musical number. 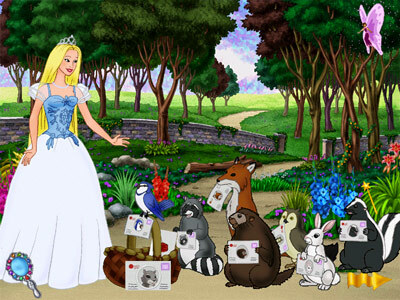 Princess Barbie hops up on a bridge, hopped up on the love she feels for her dear prince, and sings a song. Hey, it worked! Thanks, WordPress Audio Player plugin. Oh, the possibilities. 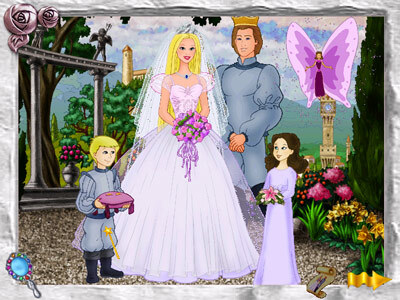 Back to the game, though, as soon as Princess Barbie steps off the bridge, she meets a boy by the town well. The dunce has gone and accidentally dropped a bunch of rather important stuff in the well and the activity is to fish it back out with the bucket. So yeah, Princess Ken makes it back safely (one of the later activities is to help sail Ken’s boat back through severe ocean weather and dolphins) and finally, formally proposes to Princess Barbie. The proposal wasn’t even a lock as the Barbie was making all of these preparations. Wow, that could have been one heck of a plot twist for a fairy tale video game if Ken found another princess abroad. whoever designed the video game… they could have made the graphics look a little better..
this is the BEST computer game ever! i used to play it when i was little, then we moved and i cant find the disk. i was watching ‘say yes to the dress’ today, and that made me think of it. i think im gonna buy a new one, i want to play it sooo bad right now!